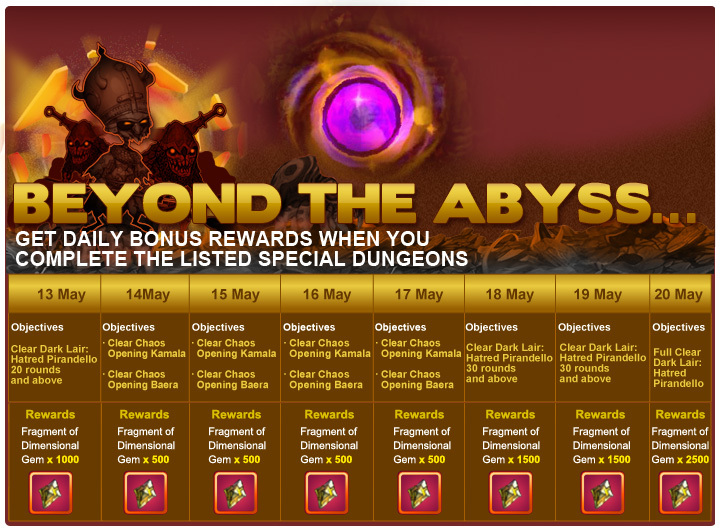 - This event starts on 13 May 2012, at 0000HRS (GMT+8) and ends on 20 May 2012, at 2359HRS (GMT+8). 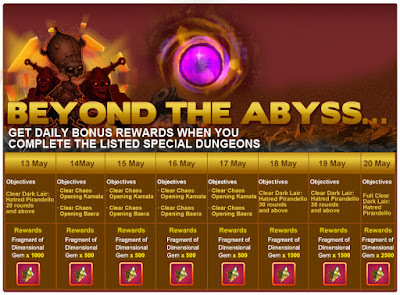 - Players must successfully complete and clear all the designated dungeons before 2359HRS (GMT+8) at least once to be eligible for that day’s rewards. - The Final Boss in both Chaos Openings must be killed to qualify for the respective rewards. - Players may choose to solo or party up for this event. It is especially recommended to party up to attempt the Dark Lair: Hatred Pirandello. - The Daily Rewards will be credited to all eligible players on the next working day (Mon-Fri) before the end of that day (2359HRS GMT+8).